Professor Bliss has broad research interests in fluid mechanics, aerodynamics, acoustics, and structural dynamics. His work emphasizes improved understandings of physical phenomena and the development of innovative ways to solve important engineering problems. 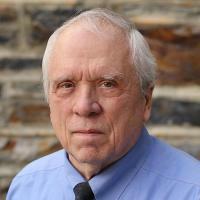 Professor Bliss recently developed a general analysis method called Analytical/Numerical matching (ANM) that combines numerical and analytical solutions to gain accuracy and computational efficiency. ANM is currently being applied to a variety of problems in aerodynamics and structural acoustics. Much of Professor Bliss' research on fluid flows involves the aerodynamics of lifting surfaces and vortex wakes. For helicopter wakes he has developed curved vortex elements, constant vorticity contour wake models, and influence coefficient techniques. In collaboration with a private company, these have been incorporated into commercially available computer programs used by industry and government to predict helicopter performance, vibration, and noise. Currently, ANM is being used to develop a new unified treatment of lifting surfaces and wakes in unsteady compressible flow. Professor Bliss is also developing a new vortex roll-up analysis, and using ANM to study helicopter blade/vortex interaction. In acoustics, Professor Bliss' primary effort is in the application of ANM to structural acoustics, particularly to acoustic scattering from submerged elastic bodies with structural discontinuities. He has also developed a method called Alternate Resonance Tuning (ART) to prevent low frequency sound transmission into flexible wall enclosures, with applications to aircraft interior noise. He also conducts research on mathematical homogenization applied to structural acoustic systems, and on general boundary conditions for bulk-reacting sound absorbing surfaces. Su, K; Bliss, D, A novel hybrid free-wake model for wind turbine performance and wake evolution, Renewable Energy, vol 131 (2019), pp. 977-992 [10.1016/j.renene.2018.07.108] [abs]. Su, K; Bliss, DB, A hybrid free wake simulation comparison of turbine wake steering with innovative turbine designs, Proceedings of the Asme Turbo Expo, vol 9 (2017) [10.1115/GT2017-64105] [abs]. Su, K; Bliss, D, Wind farm performance improvement by using wake transport, Annual Forum Proceedings Ahs International, vol 4 (2016), pp. 3498-3509 [abs]. Dowell, EH; Bliss, DB, New Look at Unsteady Supersonic Potential Flow Aerodynamics and Piston Theory, Aiaa Journal, vol 53 no. 8 (2015), pp. 2419-2419 [10.2514/1.j054540] [abs]. Dowell, EH; Bliss, DB, New look at unsteady supersonic potential flow aerodynamics and piston theory, Aiaa Journal, vol 51 no. 9 (2013), pp. 2278-2281 [10.2514/1.J052088] [abs].